For Mother's Day, I attempted my first Key Lime pie. I think it turned out quite well. Mix the ingredients and press them into a 9" pie plate. Bake in a preheated 350F oven for 10 - 12 minutes until lightly browned. Mix filling ingredients until well combined. A chemical reaction between the lime juice and the milk will cause it to thicken. Cool! 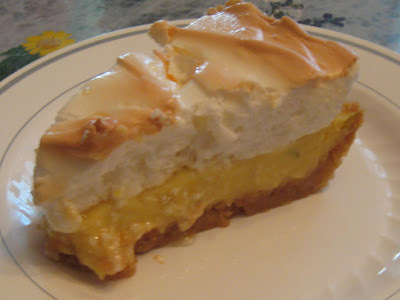 Pour into the prebaked pie shell and bake for 7 minutes, until the top is set enough to support the meringue. Beat eggwhites with cream of tartar until foamy. Gradually add sugar and beat until stiff and glossy, but not dry. 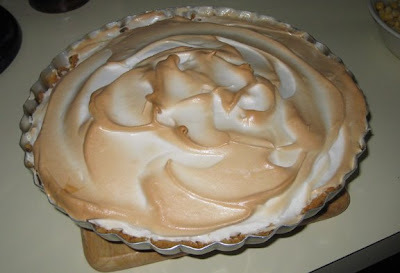 Spread onto the pie, making sure the meringue goes all the way to the crust. Bake an additional 20 minutes until nicely browned. I also made the shrimp with apple salad and peanut butter sauce I made a couple weeks back, preceeded by a stacked tomato and corn salad on a crouton. Well, it was supposed to be stacked, but when I removed the mold, the salad fell all over the place. Still, it tasted good and would be a good base for a mound of jumbo lump crab meat. Next time!